Stutvoet TS, Kol A, de Vries EGE, de Bruyn M, Fehrmann RSN, Terwisscha van Scheltinga AGT, de Jong S.
Immune checkpoint inhibitors targeting programmed cell death protein 1 (PD‐1) and programmed death‐ligand 1 (PD‐L1) have improved the survival of patients with non‐small cell lung cancer (NSCLC). Still, many patients do not respond to these inhibitors. PD‐L1 (CD274) expression, one of the factors that influences efficacy of immune checkpoint inhibitors, is dynamic. Here, we studied the regulation of PD‐L1 expression in NSCLC without targetable genetic alterations in EGFR, ALK, BRAF, ROS1, MET, ERBB2 and RET. Analysis of RNA sequencing data from these NSCLCs revealed that inferred IFNγ, EGFR and MAPK signaling correlated with CD274 gene expression in lung adenocarcinoma. In a representative lung adenocarcinoma cell line panel, stimulation with EGF or IFNγ increased CD274 mRNA and PD‐L1 protein and membrane levels, which were further enhanced by combining EGF and IFNγ. Similarly, tumor cell PD‐L1 membrane levels increased after coculture with activated PBMCs. Inhibition of the MAPK pathway, using EGFR inhibitors cetuximab and erlotinib or the MEK 1 and 2 inhibitor selumetinib, prevented EGF and IFNγ‐induced CD274 mRNA and PD‐L1 protein and membrane upregulation, but had no effect on IFNγ‐induced major histocompatibility complex 1 (MHC‐I) upregulation. Interestingly, while IFNγ increases transcriptional activity of CD274, MAPK signaling also increased stabilization of CD274 mRNA. 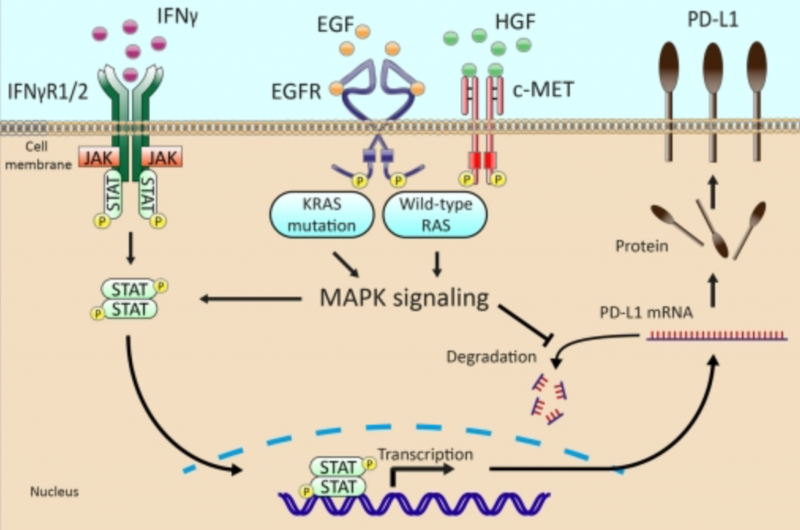 In conclusion, MAPK pathway activity plays a key role in EGF‐ and IFNγ‐induced PD‐L1 expression in lung adenocarcinoma without targetable genetic alterations and may present a target to improve efficacy of immunotherapy. April 16, 2019 in Publications, Science.